We Service Springfield, Missouri and the Surrounding Areas. National Fireplace Institute Certified Technicians on staff. At All Sweep Chimney Service we work hard to keep your home fires burning safely. With 25+ years experience in the fireplace business we have the knowledge and experience to keep your heating appliances working safely. 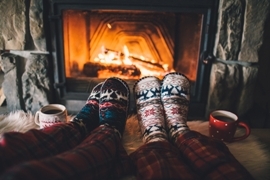 There is nothing more relaxing than snuggling by the fireplace and enjoying a good book or a cup of your favorite hot cocoa. We want you to have a piece of mind knowing that your fireplace, wood stove or pellet stove is operating safely. It is critical that you have your chimney inspected and cleaned at least once a year. The cost of NOT having this done can be catastrophic. Burning wood to keep the family warm and save money on your utility bill can be a safe and satisfying alternative. Keeping your fireplace or appliance in good clean working order will go a long way in keeping your family and home safe from fire and smoke damage. Dirty flues can lead to chimney fires, carbon monoxide poisoning, and loss of property and life. Many fires are caused by the ignition of Creosote. This is a black tar-like substance that normally builds up in your flue. Annual inspections and cleanings can help reduce this risk. One of the main causes of chimney damaged is a cracked or damaged crown. Chimney Crowns will crack over time and will need to be repaired. Let us show you how we can apply a flexible crown seal coating that will protect your crown and chimney for years. Our system will repair damaged chimney crowns and eliminate chimney leaks caused by water penetration and absorption. A crown is the cement slab that sits at the top of your chimney and protects the brick and mortar joints from water damage. Let us show you how applying a crown seal will stop crown water penetration into the interior of your chimney. This is an inexpensive way to protect your chimney now so you don't have costly repairs later. The flashing around the base of your chimney is a very important part of the your chimney construction. Are you seeing water leaks around the top edge of your fireplace or in the ceiling? This can be caused by a chimney flashing that is not shedding water off and around your chimney. All Sweep Chimney Service can stop these costly leaks with a new flexible flashing seal. It covers over your leaky flashing and stops water leaks from around your chimney.